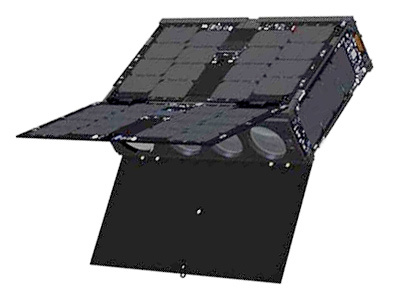 Astro Digital, formely known as Aquila Space, (formed from the core team of the former Dauria Space daughter Canopus Systems) developed the Landmapper-BC (formerly known as Corvus-BC) earth observation CubeSat (6U). The Landmapper-BC satellites are based on the Perseus-O satellites developed at Canopus Systems, before Dauria and Canopus seperated. The satellites feature a broad coverage multispectral (Red, Green, NIR) imaging system with a resolution of 22 meters per pixel. Eventually, Aquila Space plans to send eight to ten satellites into the Landmapper-BC constellation to capture daily, multispectral imagery of the world’s arable land. The first two satellites, Landmapper-BC 1 and 2, were launched in July 2017 on a Soyuz-2-1a Fregat-M rocket, but both failed shortly after. The failure might have originated in a faulty Fregat thruster damaging some of the CubeSats on the launch. The next satellite, Landmapper-BC 3, was launched on 28 November 2017 as a copassenger on a Soyuz-2-1b Fregat-M rocket, but was lost due to an upper stage problem. Landmapper-BC 3 v2 was successfully launched by an Indian PSLV-XL rocket in January 2018. Landmapper-BC 4 was launched on Spaceflight Industry's SSO-A multi-satellite launch on a Falcon-9 v1.2 (Block 5) rocket. Landmapper-BC 7 (Corvus-BC 7) - 2019 Sr PSLV with ? Landmapper-BC 8 (Corvus-BC 8) - with ? Landmapper-BC 9 (Corvus-BC 9) - with ? Landmapper-BC 10 (Corvus-BC 10) - with ? Landmapper-BC 11 (Corvus-BC 11) - with ? Landmapper-BC 12 (Corvus-BC 12) - with ?